It’s a wide-screen world, and based on the latest version of iDVD, Apple is getting ready for the oncoming high-definition DVD evolution. The future of burning high-definition discs is currently unclear due to two new competing standards, but improvements in iDVD 6 (which are outlined in this first look ) indicate that Apple is preparing for what’s ahead, while adding welcome features for people creating DVDs today. You can create wide-screen iDVD projects for viewing on your wide-screen TV. iDVD 6’s themes have been designed to accommodate both the wide aspect ratio and the standard (4:3) ratio. In fact, you can switch between them easily in the same project. Some older themes have been updated for the wide-screen format, and even the ones that still work best in the standard ratio will now also work in wide-screen format. With that newfound flexibility comes another bonus: you can now resize the iDVD window. If you’re working on a large monitor, you can expand the window to a more comfortable size—the window in previous iDVD versions looks like a glorified postage stamp on a 30-inch Apple Cinema Display ( ; March 2005 ). Another example of Apple’s forward-looking approach is its most significant new feature in iDVD: Apple has finally opened the door to burning projects with third-party optical drives. In iDVD 6, you can burn a DVD from a Mac that doesn’t include a SuperDrive, a restriction that Apple arbitrarily imposed in earlier versions; iDVD 5 enabled you to save the project to a disc image, but you still needed to find a Mac with a SuperDrive to burn your project to a disc. While preparing for the future, Apple hasn’t left current users behind. Although some folks prefer to shoot video and photos and then edit them to their liking, a lot of people would rather throw it all on a DVD that has a little structure and polish without doing all the work. That’s where the new Magic iDVD feature comes in. Magic iDVD is a good starting point for developing a project, by letting you easily choose elements to fit into one of iDVD’s elegant themes. 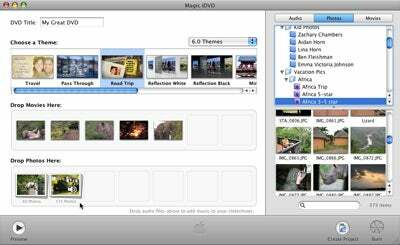 Like the Magic iMovie feature found in iLife ’06 suite-mate iMovie ( ; April 2006 ), Magic iDVD lets you choose a theme and grab a bunch of video footage and photos, and then it assembles everything for you. Its interface is straightforward, and the result works well either for burning to a disc or as a foundation for customizing later. That said, Magic iDVD could use a few slight improvements to make it even better. For example, it needs some indication of how much disc space your material is going to occupy, so you don’t delete media blindly in an attempt to stay within a disc’s capacity. Also, the feature needs controls for choosing transition styles for slide shows (which are currently picked randomly) and for selecting a project’s aspect ratio. (You can, however, modify both options by turning the Magic iDVD into a regular iDVD project.) Speaking of slide shows, you’ll discover that iDVD is no longer bound by the 99-photo limit. Due to a clever method of bridging sections of the DVD specification, the iDVD team has made it possible to cram as many as 9,801 photos into a single slide show. The Map view became more functional in iDVD 5, but in iDVD 6 it finally incorporates the ability to rearrange sections simply by dragging them. Now you can move a slide show from the main menu to a submenu, or promote submenus buried a few levels deep. I’m particularly fond of the new Smart Delete feature of the map. Control-click on a submenu that you want to remove and choose Smart Delete to zap the submenu but retain the elements (movies, sub-submenus, and slide shows, for example) further down the hierarchy. The ability to resize the iDVD window helps when working in Map view, too. Instead of making the map elements smaller to fit into the visible space—which makes it harder to identify them—just increase the window size. The map also points out when potential errors crop up. Position your mouse pointer over a triangular warning icon to view a Tool Tip explaining the problem. A number of smaller improvements make working in iDVD 6 better than working in previous iDVD versions. At long last, submenus are referred to consistently as submenus, not folders (which seemed confusing to newcomers). Also, I’m not sorry to see that the Customize panel is gone; it has been replaced by an iMovie-style set of panes that occupy the right side of the window. The only continuing irritation is that playback of the motion effects and previews is choppy, even on a fast Mac (a dual-processor 2.3GHz Power Mac G5, for example). However, the burned discs played back smoothly in my DVD player. iDVD used to be a simple application that let you burn a nice-looking DVD, thanks to Apple’s themes. With iDVD 6, you can further control how you structure and customize your project, or let Magic iDVD do the thematic work for you. Although the future of DVD is uncertain, iDVD is ready to adapt to whatever comes next.